Once again we have our ever popular THS at Keith Farm, in the seaside village of Sea Palling, on the North Norfolk Coast. We have two sets of dates for you to choose from, May and August. If you are planning on joining us in May, then there is no need to book, but if you are planning on coming to stay with us in August then we recommend you book. Please click here to download the booking form. Closing date for August booking forms is 29th July. If you haven’t booked please phone before you come to avoid disappointment. We head back to this beautiful stretch of the Norfolk coastline for three weeks in August 2018, with this site opening on Friday 10th August at 12pm and closing on Sunday 2nd September. Site fees for this THS will also be £10 per unit night. Booking is advisable if you would like to join us at this THS. You can download a booking form here. 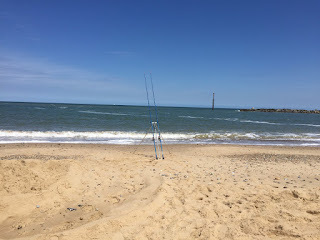 The site is only 200 yards away from a stunning sandy, blue flag beach, with a bus stop, shops, a cafe and a pub which serves food all a short walk away. The Broads, Norwich and boat hire are all within easy cycling distance from the site. Sea Palling Beech during the day and early evening. The local Supermarket and Post Office in Sea Palling is perfect for picking up the daily essentials and the all important bucket and spade or other essentials needed for fun at the beach! For other items or a larger supermarket then less than 5 miles away is the town of Stalham where there are a range of shops, a small market on a tuesday and a Tesco Supermarket and petrol station. Fishing – Martham Pits -The Martham Pits consist of a number of small fishing lakes, all adjoining each other, which are located just to the east of the River Thurne. A day ticket is required to fish. Contact 01493 748358 – Ferrygate Lane, Martham, NR29 4RG.